PORT CHARLOTTE, Fla. -- Charlotte County deputies have identified two men charged in a shooting incident in the Gulf Cove community Wednesday morning. Early Wednesday morning, deputies responded to reports of shots fired incident on Montgomery Drive near Stone Street. A 2nd crime scene involved a vehicle on nearby Curry Terrace. 19-year-old Sterling Butler was quickly pulled over leaving the scene along Holcomb Road. 21-year-old Darnell Horace was later located hiding in a wooded area near Holcomb Road and Quinlan Avenue. Later in the morning, deputies identified Daniel Bouchard as a person of interest and took him in for questioning, along with Butler and Horace. 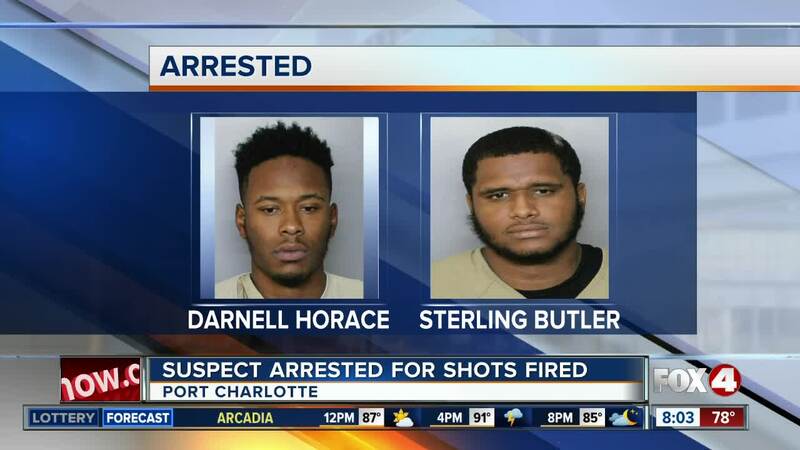 After interviewing all three men, they determined that Horace was the person who fired three shots into an occupied vehicle. Bouchard told investigators that he was previously involved in an altercation with the victim and two other men, but was not involved in the shooting. 19-year-old Sterling Butler was identified as an accomplice in the shooting. He was arrested later Wednesday and charged with Shooting into an Occupied Conveyance and Violation of Probation. Horace was arrested and charged with Shooting into an Occupied Conveyance and Tampering With Evidence.